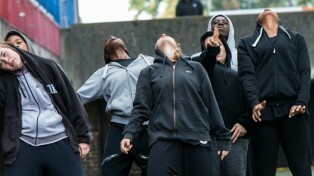 In 2014 East London Dance commissioned Vocab Dance Company to research and develop WORD!, a site-responsive dance production taking place on the De Beauvoir Estate. WORD! is set to a score of original music, featuring spoken word with choreography by Alesandra Seutin and developed by her ensemble cast of professional dancers and actors. WORD! addresses the subject of youth culture and stereotypes bringing young people’s voices to life through inventive movement and gritty story telling. In 2015 we were awarded the Discover Young Hackney Award by Hackney Council to deliver the next phase of research and development. This phase, taking place in February 2016, will work directly with young people developing spoken word and dance material fundamental for a further performance production of WORD! in 2017. 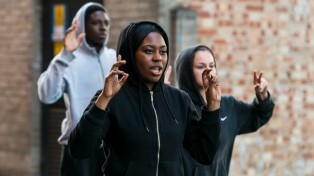 The ambition, post Discover Young Hackney, is to continue collaborating with young people on the De Beauvoir Estate, working towards a full professional production featuring young people alongside a professional cast.